Know that if you change your mind about your new hot tub or sauna and opt to return it, we will accept a return within 30 days of delivery. Once it has been returned we will refund what you paid less a 10% restocking adjustment. Any special delivery or installation related costs for removal would still be your responsibility as it was on the original delivery. If you feel you’d like to switch to another hot tub or sauna other than the one originally selected, we will help get you into a new model. We’ll switch it out for a new tub or sauna at the same time for the difference in price plus a 10% restocking adjustment for your original purchase. Any special delivery or installation related costs for replacement would still be your responsibility as it was on the original delivery. Any money prepaid at time of order is designed to lock in special pricing and reserve product that’s in stock or initiate your order. If, for any reason, you decide it’s not the right time for you to move ahead, we’ll fully refund any prepaid funds up to 90 days from your order date or until your product is delivered. Items given to you in advance of delivery would need to be returned for refunds to be processed. We offer standard full service deliveries for most hot tubs and saunas at no cost to you within our service area in Puget Sound. No curb-side deliveries here! We’ll set your tub or sauna up in its final position, show you how to operate and care for it, and remove any packaging related to installation. Deliveries outside of our service area and additional services such as crane delivery or electrical contracting would be yours to handle. We want your hot tub or sauna to be exactly where you’d like it on your property. If you find a new place for it within one year after your delivery, we’ll relocate it to the new spot at no cost to you. As with your original installation, this would apply to a standard full service delivery. Additional services such as crane delivery or electrical contracting would be yours to handle. We’re proud to offer factory-trained service techs who are also licensed electricians in Washington. Olympic’s techs are company employees, not outside contractors. We perform all warranty work for original purchasers of Hot Spring, Hot Spot and Freeflow Spas, as well as our line of Finnleo Saunas. This service is offered in our territory in Greater Puget Sound. We’ll continue to service and support your product once your warranty is finished and do our best to always get genuine parts from each manufacturer to protect your investment for as long as you own it. We recognize everyone has a busy life. That’s why we offer home delivery for many of the staple products needed to keep your hot tub in tip top shape. Inquire with our Service Center team about our current offerings, or check the available products out at our E-Store. 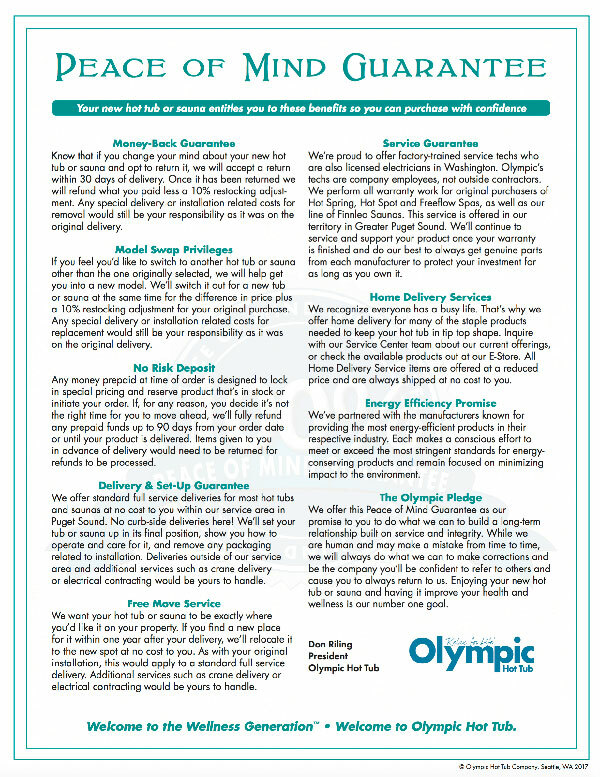 All Home Delivery Service items are offered at a reduced price and are always shipped at no cost to you. We’ve partnered with the manufacturers known for providing the most energy-efficient products in their respective industry. Each makes a conscious effort to meet or exceed the most stringent standards for energy- conserving products and remain focused on minimizing impact to the environment. We offer this Peace of Mind Guarantee as our promise to you to do what we can to build a long-term relationship built on service and integrity. While we are human and may make a mistake from time to time, we will always do what we can to make corrections and be the company you’ll be confident to refer to others and cause you to always return to us. Enjoying your new hot tub or sauna and having it improve your health and wellness is our number one goal. Bringing you the best in relaxation is our business. Your enjoyment will always be our #1 goal.